Cambridge Technicals are vocational qualifications at Level 2 and Level 3 for students aged 16+. They can be offered alongside A Levels as part of a balanced curriculum. Designed to support progression to higher education, they attract UCAS tariff points and are eligible for Key Stage 5 Performance tables for 2021-2022. Want to find our more? Download our Cambridge Technicals Explained Summary Brochure. We've kept the admin to a minimum so you can focus on the teaching. Check out our online video to get an overview of the support available when planning, teaching and assessing our Cambridge Technicals qualifications. Or why not book onto one of our FREE webinars on administration essentials? You can also keep up-to-date with all the latest Cambridge Technicals updates, CPD events and resource support by joining our mailing list or by following us on Twitter OCR_Vocational. 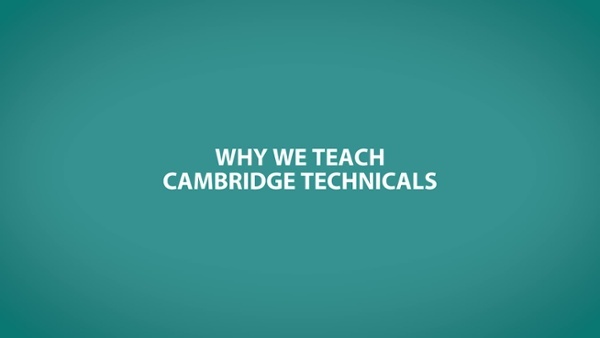 You can also view our video on the administration essentials and moderation process for Cambridge Technicals. We provide one-to-one moderation for schools and colleges teaching our vocational qualifications. This enables you to discuss how the course is running and feel supported that you are doing the right thing for your students. Check out our online videos below to get an overview of the support available when planning, teaching and assessing our Cambridge Technicals qualifications.